Received his D.M.D. from the University of Pennsylvania, School of Dental Medicine and Certificate in Periodontal Prosthodontics with an M.S.D. from the University of Washington, School of Dentistry. He maintains a private practice limited to prosthodontics in Tacoma and Seattle, Washington and is an Affiliate Professor in the Graduate Restorative Program at the University of Washington. Dr. Kois continues to lecture nationally and internationally, is a reviewer for many journals and is the Editor-in-Chief for The Compendium of Continuing Education in Dentistry. Dr. Kois is the recipient of the 2002 Saul Schluger Memorial Award for Clinical Excellence in Diagnosis and Treatment Planning, and received a Lifetime Achievement Award from both the World Congress of Minimally Invasive Dentistry and the American Academy of Cosmetic Dentistry. He is the past president of both the American Academy of Restorative Dentistry and American Academy of Esthetic Dentistry, and a member of numerous other professional organizations. In addition, he continues to work with restorative dentists at the Kois Center, a didactic and clinical teaching program. John is not a master because he has “great hands”—-an inborn talent for dentistry. He became a master through dogged perseverance and years of hard work, with an attitude that embraced challenges. He is a student every day, willing to be wrong and willing to change his beliefs when necessary. John changes the lives of those who come to his teaching center, both through his personal example and his unwavering belief that inside each student is an expert waiting to be born. John Kois is an outstanding clinical dentist because he views every patient and every restoration as an opportunity to excel. Yet he is not afraid to examine a failure, regarding it as an opportunity to improve and avoid that pitfall tomorrow. His dentistry sets a standard for precision and he is recognized by his peers as a master clinician: He is the expert that other dentists seek for their own dentistry. He uses practical experience to develop systems and checklists so Kois-trained dentists can more easily and uniformly provide excellent care to their patients. It is these systems that form the core teachings at the Kois Center. John Kois is a relentless questioner: Why does this smile look so natural? Why have the teeth worn in this particular pattern? How can we make our success more predictable? He is unwilling to blindly accept conventional thinking about dentistry without rigorous evaluation. He is also willing to reject popular theories that have no scientific basis. When he saw too many exceptions to accepted beliefs, he carefully examined his own work to better understand what was successful and why. He formed his own research center to test theories and add to the science of dentistry—entirely so dentists can make better decisions for their patients. He continues to develop innovations and instruments to make excellent dentistry easier to provide. Have you ever been inspired by a teacher: one who saw the greatness inside of you? A teacher who helped you reach a goal that you would have never believed was possible? A teacher who could present complex material in a clear, understandable way? John Kois is that teacher. Passionate about his subject, he works long hours year after year to stay current and design new ways to teach. He is a successful teacher because he has never stopped being a student: questioning, challenging, learning. He understands new knowledge must be used for learning to be effective, so he developed comprehensive notebooks for each student to take home to aid in implementing what they had learned. John believes that together we can be better than any of us could ever be separately, and his leadership has created and fostered a unique community of likeminded dentists who are committed to continuous learning. 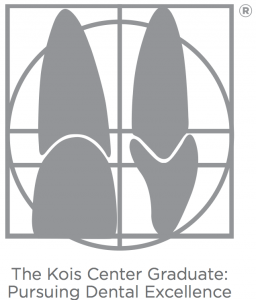 Kois Center graduates are members of a family—a think tank populated with dentists dedicated to helping each other and their patients achieve the absolute best. When a dentist completes a class, they can stay connected with peers and mentors for support and advise them on their own journey to expertise.